I suppose I have been feeling a little nostalgic lately so I have been thinking more about my youth and childhood. I grew up in the east where the summers were humid and the air conditioners were scarce (the parents always had one in their rooms, but the kids relied on the window box fans hoping to get a good cross draft). Laying in the dark, I listened to my three sisters sleeping in the same room as the crickets sang and lightning bugs blinked outside our window. I remember laying there and wondering what my future would hold and if someday I would ever be a good mother. The idea of having children of my own seemed so far away at such a young age. I admired my mother immensely as I watched her raising eight children. I couldn’t understand how she did it all…but, I hoped I could be half the mom she was to us. Now, I’m not only a mother, but I am also a grandmother. I lay in my bed at night listening to my husband sleep while the air conditioner whirls outside our window (the only way to stay cool in San Antonio at night). I listen now to my 20-year-old son come hobbling down the stairs on his crutches since having his leg amputated and my 25-year-old daughter whispering to him as they sit at the kitchen table enjoying late night cereal together. As my grandson sleeps in the room upstairs, I also think of my 22-year-old son living far away in Idaho preparing to marry the love of his life. To see my life now, I did become a mother…I did become a good mother…I love my children…I love the crazies that they are and I wouldn’t trade my life with any other person. We all can sometimes wonder about our futures and if our past prepared us for our future. I often talk about the road less travelled but as we travel our own unique roads, we can discover who we are meant to be by our roads. I didn’t follow the same road my mother did, but I became a good mother just like she was. Kathy was born and raised in the Philadelphia, Pennsylvania area. Being one of eight children, Kathy always knew that it was easy to get lost in the crowd. It was rare she got to say what she was thinking because all the older siblings felt it necessary to speak for her. Writing became a big part of her way to express herself. Over the years, Kathy has found it important to write and to learn from others’ stories as well. 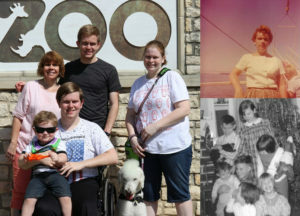 Kathy has experienced the joys and struggles of raising a daughter and two sons, including a son born with a clubfoot. Today, her children are still the source of her joy and happiness and include adding a wonderful grandson to the mix who keeps everyone laughing. Kathy’s husband Ken has always been supportive of her endeavors including returning to college in her forties to get her Bachelor’s Degree from The University of Texas at San Antonio (UTSA) in Public Relations & Communications. She works part-time at a writing lab at a local community college and also as a journalist for an international website called Broadway World. These jobs along with running the Iron Butterflies Project allows Kathy to make a difference in the world and help others to find themselves as well.